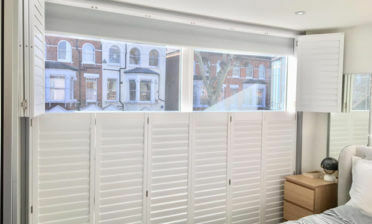 These shutters were fitted for a well known property developer client of ours who need a solution for one of their properties in Chiswick, West London. The top floor windows of these houses are very big and required a solution that would help with bright light coming in each morning. Although the views are stunning from these windows, the light that enters each morning can be an annoyance to those living in the property, so a dressing which can be adjusted to maintain views while blocking direct light was a must. 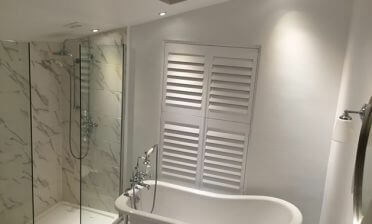 Our shutters were the perfect solution for this job. 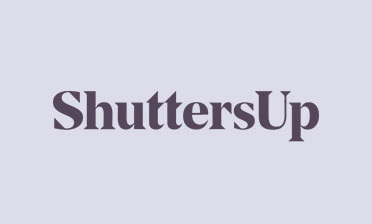 Curtains require being either opened or closed, whereas our shutters can be adjusted perfectly and in different sections depending on how you wish to regulate the light. Due to the sizing and the shape of the windows they are the only dressing where you can truly get a made to measure fit which covers the whole window area! 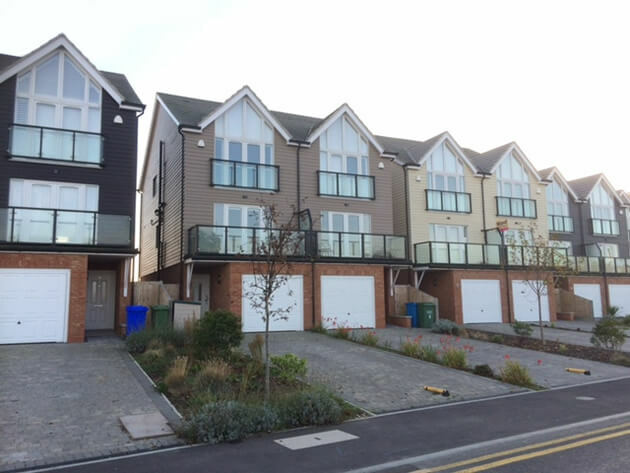 As you can see from the picture, the shutters can be fully closed at the tops the majority of the time, with the bottom sections adjusted throughout the day however the client sees fit. We created the shutters using hardwood from our Sumatra range using 76mm louvres throughout and a hidden tilt rod system, for a clean and minimalistic look. We finished the shutters in pure white with matching hinges which looks great for both the exterior and interior.